My grocery store has been trying to unload some about-to-expire Plugra butter by selling it for $1.58 per pack (8 oz). At first I wasn’t sure whether to bother with the sale since the butter’s freshness date was up in two weeks, but I came to my senses and bought a couple of packs anyway. Thanks to the clearance butter, I could afford to test a few different shortbread recipes back-to-back just to make sure this one was still my favorite. Yup! Still is! This recipe is based on one my old neighbors shared a few years ago. Rice flour gives it a slightly grainy yet sandy texture, ginger adds a hint of flavor without being too spicy, and the step of melting the butter makes is slightly easier to assemble since you don’t have to pull out the mixer. My neighbors make double the recipe in a 15×10 inch pan. I make it in a 9 inch square pan so that’s how I’ve written the recipe. However, if you want an even smaller batch of shortbread (maybe you want to test a few recipe back to back, too?) you can halve it once more and bake it in a 9×5 inch loaf pan. It’s quite versatile! I’d say the hardest thing about this recipe is you have to remember to buy the rice flour. I usually buy it in small amounts from the Central Market or Whole Foods bulk bin, and I’ve also been known to make it myself by just grinding up some rice in my mini coffee grinder. That works in a pinch, but the commercially ground rice flour is a little better. And finally, the recipe is all in weights. If you use volume measurements, it won’t be as precise, so I recommend using the scale. Try it and let me know what you think. It’s a quirky little recipe given the melted butter, the higher baking temp and the fact you poke holes at the end of baking rather than before, but my family really likes this one a lot. The two I compared it with this week were King Arthur’s (which is also VERY good) and an old one on Food.com. Shortbread made with melted butter and rice flour. Line a 9 inch square metal pan with nonstick foil. Combine the all-purpose flour, rice flour, sugar and ginger in a large mixing bowl. Gently melt the butter in a microwave- safe glass measuring cup using 50% power. Mix the vanilla with the melted butter and let it cool for about five minutes. Add the butter to the flour mixture and stir with a wooden spoon until blended. Transfer mixture to the pan and pat it down flat. Put it in the refrigerator for 30 minutes or until cold. Sprinkle top of shortbread with sugar. Place in the oven and bake for about 30 minutes or until middle appears set and edges are lightly browned. Using a 4 pronged fork or whatever fork you feel like using, poke holes in the warm shortbread. Poke them at intervals and plan on cutting around them. 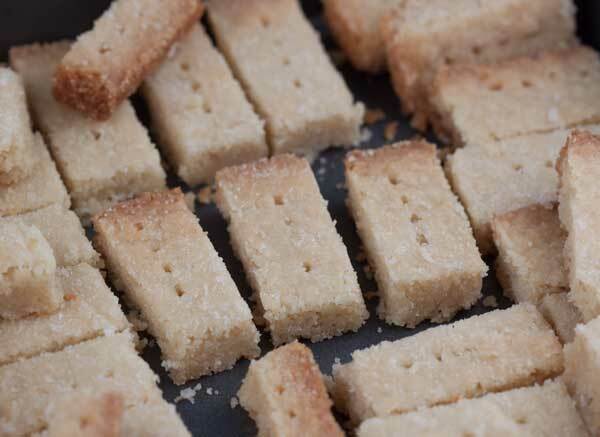 Using a razor blade or sharp knife, score the shortbread gently into 32 fingers (or whatever size you want). Do not lift it from the pan at this point. Let sit until completely cool, then lift from pan. Use a knife to cut through the areas you lightly scored. Store in a tin. These stay fresh for weeks. Salt: If using "lightly salted" butter (as opposed to just plain "salted") you might want to go ahead and add 1/4 teaspoon of salt to the recipe. For best results, weigh your ingredients. If your dough is too dry, that means you used too much flour. For best results, weigh your ingredients. Don't overcook. Edges should be just browned and shortbread should still be pretty soft when you pull it from the oven. Yes. I’d buy all the Plugra too and stars it in the freezer. 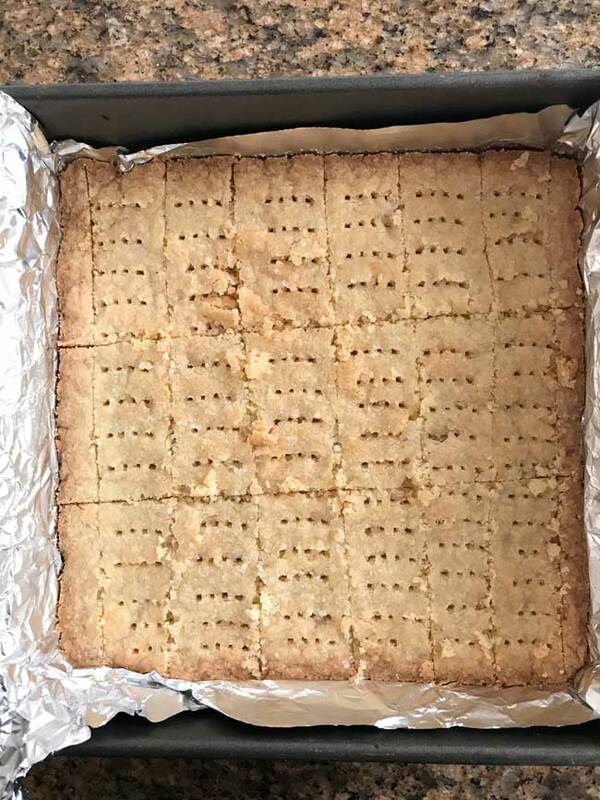 The shortbread looks really good. What’s funny is I went back to the store the next day and someone had done just that. It was gone. Then I went back again the NEXT day and the store had replenished it with more almost-out-of-date butter. I should probably do another check this afternoon. Those look delicious! And I would have bought ALL the butter and put it in the freezer!! !